There’s only one Beef ‘O’ Brady’s in Minnesota but they’re evidently big in the southeast US. And now they’re coming to Jasnoch Construction’s Heritage Square Retail Center between Jefferson Rd. and Hwy 3, just north of the Community Resource Bank. Hey, it’s just down the street from my new Heritage Drive/Hidden Valley neighborhood. 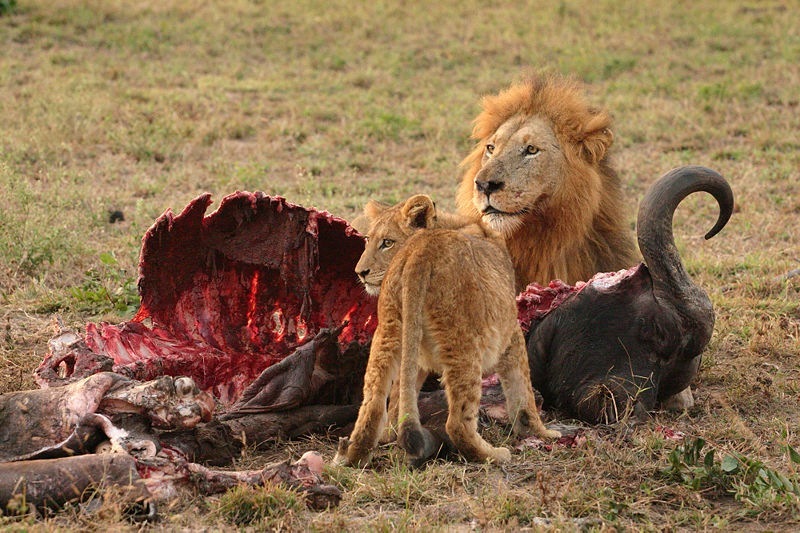 Carnivores unite! Debra, your Just Bread, as all of your products, is awesome. I am pleased to say that Children’s Pleasure and Just Bread are a staple in our home. Do we have a time for the opening on Monday? Will it be a lunch or dinner opening? I was out of town the last few days, and just got back today. Did the open go well? I visited Beef O’ Brady’s yesterday prior to the Super Bowl and took a dozen photos, courtesy of Tina and Chad Severson and family. The sports mural at the front door is by Brent Keske. A military-themed mural is planned for the back hallway. And they have a party room (no charge) that can be closed off. I heard that Beef O’Brady’s in Northfield is closing. Is that true? That most certainly is not true. Unfortunately we at Beef’s have been struck by some very vicious disgruntled employees who have taken to spreading rumors around this town. One of these is that we are closing. Beef ‘O’ Brady’s is alive and well and we have no plans to close. In fact we are looking at opening at least four more stores sometime in the future. One location we are looking into is Mankato – where quite a few of our staff have headed off to college. Come in and see us and feel free to introduce yourself. I would love to be able to meet some of the folks who post at this site. Thanks for letting me know. We were playing at pool league on Sunday and a few people were talking about it and surprised…and hoping it was not true because they really like the Happy Hour tap special! No problem – I welcome any opportunity to clear up these rumors. Hope to see you soon! I heard the same rumor from many disparate sources. You should take out an ad or something, Tina, because just yesterday a group of people were discussing whether Beef’s was closing or already closed! We have already considered taking out an ad in the paper. After discussing it with our Northfield News representative – the police dept – and the Chamber of Commerce we decided that it may make things worse. As I stated these people have been down right evil – the rumors and things you are hearing about are just the tip of the iceberg. We have had several discussions with the police in regards to the other things that have been happening. We did however take out a customer appreciation ad just a short time ago in the hopes that a positive light on this whole thing would help. I do enjoy going to Beef’s. The atmosphere is family friendly, the ownership is always around, and they truly care about good food and great service. The fact that the bar is segregated, and the restaurant is a plus. The fact that they ID EVERYONE is OUTSTANDING. 43 years old, and getting carded. It is wonderful, and they way it SHOULD BE everywhere. In many ways, Beef’s is setting the standard for how other establishments should be run. Good food, good staff, and a fair portion at a fair price. Beef’s is family friendly, and they do not push alcohol like a certain chain restaurant by Cub does. I am sorry to hear that there are negative rumors going around, and I urge you to stop in, and see for yourself. The staff and owners are always around, and always available. I have never wanted for anything when I have been in the restaurant, and they are extremely accommodating to my questions and requests. I also like the way that Tina and Chad give back to the community. The have a program on Sunday where a portion of your total bill gets donated to the church of your choice. Wonderful! So, don’t believe the rumors… go find out for yourself. It is a great place that is family friendly, and seems to be doing quite well. DISCLAIMER: I am not an employee, or never have been an employee of Beef’s. I am just a loyal customer, and family man that has always gotten excellent service from Beef’s and wishes to continue to support a great family run franchise. Thanks for the support! We love having you and your family as “regulars” here at Beef’s! Beef O’Brady’s…Spirit Night is a night where the restaurant promotes an organization, event or cause. Tonight’s recipient is Connected Kids and proceeds will support mentoring activities. 20% of sales during this time are donated to the designated program/organization. The key is–people need to drop their receipts into a bucket located near the door in order for it to be included in the 20% of sales donation. That way, people actually choose whether to contribute. Just wanted to drop a line to remind everybody about our “happy hour” specials. Monday through Friday 4-close we offer 99 cent 10 ounce mugs of anything that we have on draft. From 8-close we also offer our appetizers at half off and our boneless wings at 49 cents per wing. These amazing specials are also offered on Saturday from 8-close. Being that there is no happy hour offered on Sundays we offer “Football Specials”. So bring the gang in to watch the game! We do have the NFL ticket – for all you Packers fans. For those of you who prefer to stay home for the game please keep in mind that Beef’s delivers every day of the week! Oh – and I almost forgot. Along with our “kid’s night’ on Tuesday nights Beef’s will now be hosting “senior night” on Wednesday nights from 4-8 p.m.. Anyone 55 or older gets 10% off their meal every Wednesday night. I would like to let everyone know that Beef ‘O’ Brady’s will be hosting a free Christmas dinner for those less fortunate this holiday season. Dinner will be held on Christmas Eve and serving will begin at 5p.m. Anyone interested in attending our dinner please call Tina or Angie at 507/664-9112 to get your name added to the list. We will serve until all have been fed – we would just like to have a heads up on what we will be needing. You may want to notify Jim Blaha at the CAC. I know that Thursday’s Table will not be serving on that Thursday as it is Christmas day. So, I am sure some families would welcome the meal at Beef o’ Brady’s even more. We have spoken with Jim – he is going to let the folks at Thursday’s table know. We also brought him some flyers to put up. We have spoken with as many people and organizations as we can think to tell. If you have any other ideas please let me know. Very cool thing you’re doing, Tina. Beef O’Brady’s generosity is what this season is all about. It is what also is good about Northfield. The reservations list for this free Christmas dinner for those less fortunate this holiday season has grown significantly, and as David had stated in post #67, Thursday’s table will not be serving this week. This Christmas, it should be all about community, family, and helping others. They can let you know in what ways you can help. They are trying to finalize the food today. My only concern is that they are going to be seriously overwhelmed. Merry Christmas to all, and God Bless. I would like to let everyone know that Beef’s will be starting our “Fish Fry Friday’s” tomorrow night. Come on in and enjoy all you can eat fish and chips for $9.95. Hope to see you soon! 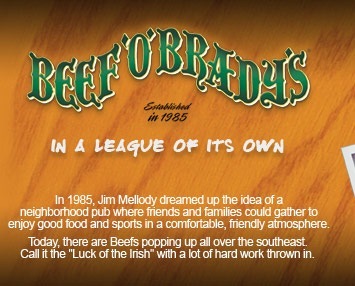 BEEF ‘O’ BRADY’s is ONE YEAR OLD TOMORROW! * Free Non-Alcoholic Drinks all day. * Happy Hour All Day. The menu was just updated on Monday with some new additional items as well! If you are in the neighborhood, stop in and wish them a Happy Birthday! Tina and Chad Severson wanted me to let everyone know that they are now up on Facebook, and folks can obtain more information regarding Beef O’Brady’s – Northfield at http://www.tinyurl.com/Beefs-Northfield . Folks can become a “Fan” of Beef’s to get information on upcoming events, promotions, and special “mystery menu items” that are only available to fans. The facebook page is publicly available to anyone, but “fans” get additional information, as well as news on their wall. There is also an area where fans can be alerted via SMS messages of updates to their mobile device. Thank you for your continued support of Beef O’Brady’s and all Northfield businesses. Tina and Chad Severson wanted me to let everyone know that they are now serving breakfast on weekends. Beef O’ Brady’s will be now serving weekend breakfast starting on August 8th at 7 AM. There will be menu ordering, as well as an “All You Can Eat” Waffle Bar (Adults $5.99 / Children $3.99) beginning Saturday, August 8th. Breakfast will be served Saturday and Sunday from 7 AM to 2 PM, with both the breakfast and lunch menus being served from 11 AM both days. Beef ‘O’ Brady’s Facebook page link has also changed. Check out http://www.facebook.com/BeefsNorthfield/ and become a “Fan” to get the latest updates on Events and Specials. Thanks, John. People should also know that they can receive Beef O’Brady’s Facebook status updates via SMS/text messages on their cell phones. It’s an alternative to Twitter. Oops! I see you included that in your comment. NEVER MIND!! The easiest method to get status updates / subscribe / become “Fans” of Beef ‘O’ Brady’s Northfield is to text “fan BeefsNorthfield” to FBOOK (32665) from their mobile phones, and they will be added nearly instantly. I just wanted to get a reminder out there that Beef’s offers a fifty percent discount to all current military personnel and their spouses every day. On Wed. November 11th – in honor of Veteran’s Day, we will be offering a free meal to all members currently serving or who have ever served in the military. Beef’s wants to say thank you to everyone who has put their lives on the line for our country. A week shy of its three-year anniversary, Beef ‘O’Brady’s will shut down Sunday, an employee confirmed Thursday. Truly a sad day coming this weekend. 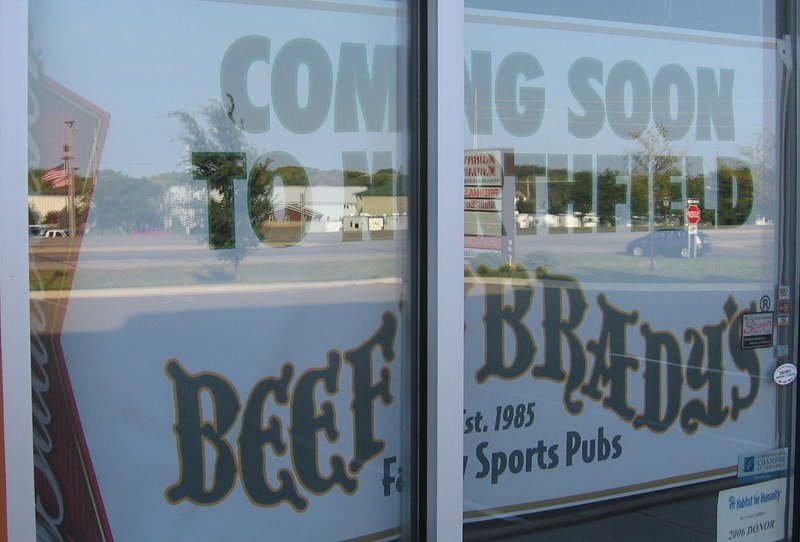 Although I was not a fan of Beef O’ Brady’s, I am sad to see yet another establishment in Northfield close.